@Frigate Only after the NFL combine is over. Sigh... With this rate of change, the game will be worth buying again in 2025 or so. 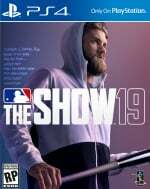 It's been largely the same game from its inception, and I haven't purchased The Show since MLB '14 (and really haven't played The Show a ton since MLB '12). @doctommaso These kinds of games are always going to be iterative due to the rate at which they release them. If you consider it takes three or four years to make a AAA game now, they get like ten months on sports games. @Frigate As a Knick fan, the AD to LA rumour mill news has been the most entertaining part of my season so far. @get2sammyb That's fair. I probably would feel otherwise had I not played it to death from 2010 to 2012. @Frigate No, All-Star game is more attention than I can give. Though if it came down to the Pro Bowl or All-Star game basketball all the way. MLB All Star game I still watch. Mets aren't good but some of our better players get a chance to go and see what it's like to play with a real team. Always hoping for vintage uniform DLC.